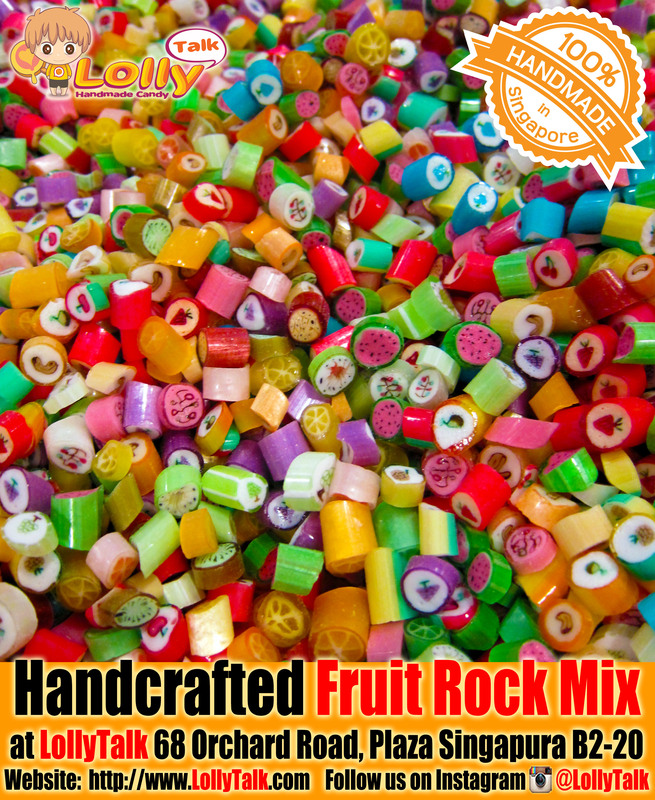 Fruit Rock Mix by LollyTalk in Bulb-bottles!!! No idea what to get for gifting? Idea! Fruit Rock Mix by LollyTalk now available in Bulb-Bottles (comes in two sizes)!!! Now you can get your authentic & yummy Fruit Rock Mix, handcrafted with awarding winning Aussie-traditional-recipe; served with love and passion! 1. LollyTalk‘s fruit rock mix consist of 19 flavours. And it consist of a mixture of 19 natural fruit extracts as well as permitted food flavourings. 2. All the lollies at LollyTalk are handcrafted using halal-certified ingredients, vegetarian friendly, no traces of nuts and no dairy products, no milk, no alcohol, no liquor and no gelatine being used. 3. LollyTalk‘s founders are trained by two Aussie Masters Ross & Judy who won Gold Medal for their Fruit Rock Mix among ALL the major rock candy makers in Australia (during the 2009 Royal Melbourne Fine Food Awards). Ross and Judy also won the title Grand Champion Rock Candy during that year too among ALL the hard-boiled confectioners. LollyTalk is the ONLY candymaker in Singapore handcrafting lollies using this award winning recipe from Ross & Judy. 4. The design of these lollies in the fruit rock mix haven’t really changes much since the founder of Aussie-style Rock Candy started them. LollyTalkare trained by Ross and Judy, who both were trained by the original founder of Aussie-style rock candy! Over at LollyTalk, we are proud to say we are the authentic third generation of candymaker; while training the fourth generation thereafter! Others might try to look like LollyTalk, but they will never taste anything near to a LollyTalk! 5. LollyTalk is proud to be the ONLY 100% Singapore brand of Handmade Rock Candy that still bringing you a visual feast & live demonstration of candy making in a Singapore retail mall (accurate from the date of this posting). Support Singapore brand, support LollyTalk!!! Do visit LollyTalk‘s flagship retail outlet, located conveniently at the heart of Singapore’s shopping district, 68 Orchard Road, Plaza Singapura B2-20. Come and immerse yourself in the complete lolly shopping experience everyone is talking about!